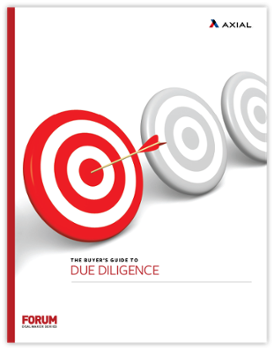 Dealmakers have become increasingly sophisticated in how they go about conducting due diligence. While the process has always been a vital component of the deal process, in the wake of the financial crisis, investors and buyers are keenly focused on unearthing non-traditional risks and other liabilities through more thorough examinations. Now more than ever, investors are getting specific when gathering information. They spend more time and often partner with more outside experts to avoid missing any potential skeletons in the closet. An emphasis on upfront legal and IT diligence has grown and new areas like cultural and values diligence are becoming commonplace. We’ve created this guide to due diligence with help from some of the most experienced investors, advisors and legal professionals on Axial. Read on for tips and best practices in some of the most complex and nascent areas of buyer due diligence.